On Tuesday, both Erick Erickson and Big League Politics, a leading conservative blogger and fringe conservative website, wrote about what they saw as a break in the Brett Kavanaugh case. A photo showing Hillary Clinton and another middle-aged woman with short hair was circulating, along with claims that the woman in the photo with Clinton was Debra Katz, Christine Blasey Ford’s attorney. 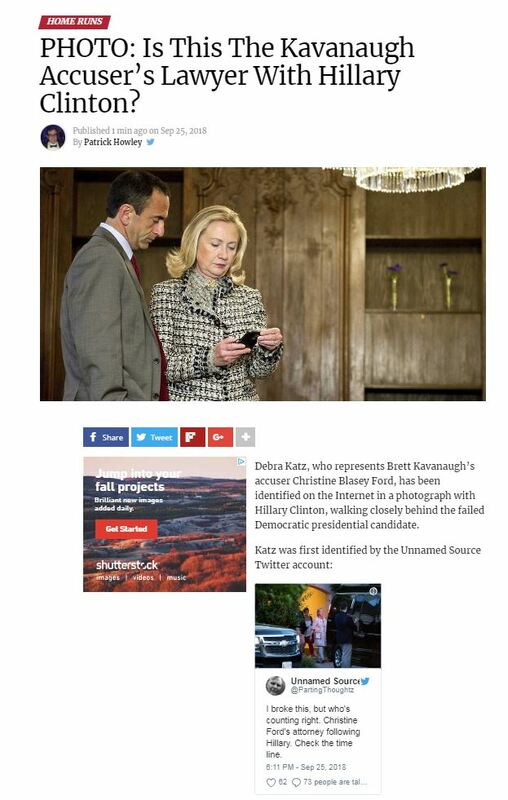 Big League Politics writer Patrick Howley wrote, “PHOTO: Is this the Kavanaugh Accuser’s Lawyer with Hillary Clinton,” citing the Twitter account @PartingThoughtz for breaking the photo, which he claimed featured Clinton and Debra Katz. However, the woman in the photo isn’t Debra Katz at all, as Media Matters pointed out. It’s Barbara Kinney, Clinton’s photographer. The photo, and accompanying conspiracy theory, apparently originated on a QAnon message board. QAnon is the conspiracy theory that claims, among other things that the Clintons are pedophiles and President Donald Trump is going to save America by jailing them and others involved in a depraved Democratic cabal. Both Erickson and Big League Politics deleted their content about the photo. Erickson even apologized on Twitter. But that didn’t stop people from calling him online. I wouldn’t sweat it, after your behavior this past week no one takes your timeline seriously anymore. Nor did it stop TMZ from picking up the photo, too, although it pulled the post after Media Matters pointed out the error. Because on the internet, adding a Clinton to a conspiracy is like putting gasoline on a fire.